Anthurium (Anthurium spp. ): growing, planting, caring. An amazing houseplant, widely grown for its ornamental foliage and brightly coloured flowering spathes. Scientific name : Anthurium spp. Anthurium - Anthurium, tailflower, flamingo flower or laceleaf - is a genus of about 1000 species of flowering plants in the arum family, Araceae, native to the Americas from northern Mexico to northern Argentina. Like other aroids, many species of Anthurium can be grown as houseplants, or outdoors in mild climates in shady spots. They thrive in moist soils with high organic matter. In milder climates the plants can be grown in pots of soil. Indoors plants thrive at temperatures between 16 °C-22 °C (60 °F-72 °F) and at lower light than some other house plants. Quick last note : Anthurium plants are poisonous due to calcium oxalate crystals. The sap is irritating to the skin and eyes. Anthurium is a genus of plants of the family Araceae, with more than 1000 species: it is one of the most important and most complex genus of the family. Most anthuriums grow in tropical rainforests of Central and South America, but some grow in semi-arid environments. 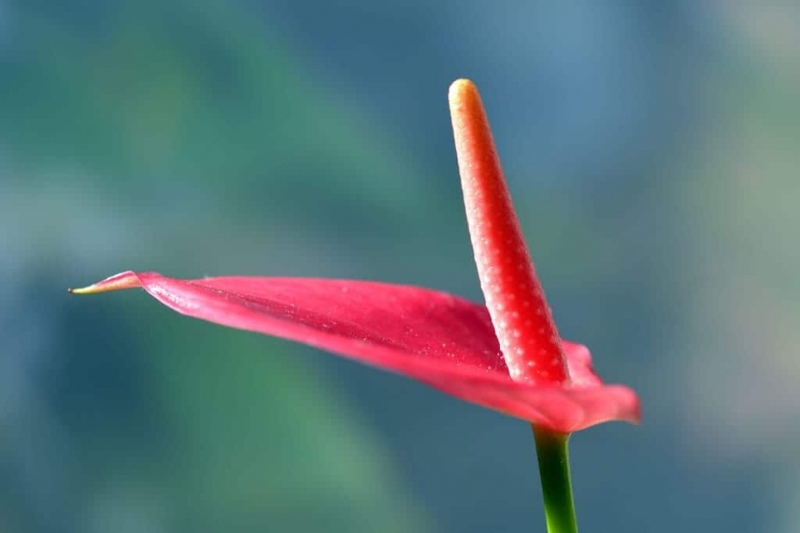 Anthurium is cultivated as an ornamental plant, with many hybrids or horticultural varieties, and as a houseplant for the ornamental value of its foliage for Anthurium crystallinum, or for its inflorescence (spathe and red spadix), such as Anthurium. scherzerianum. You can leave the plant in its original pot the first year (of course, if the plant seems cramped do not hesitate to repot it immediately). While repotting cut the flowers, it will allow the plant to concentrate its energy on recovering. Place it in intense light, filtered in summer. In spring and summer, watering should be regular but moderate: water before the topsoil is dry. Do not wait too long, especially when it's hot, because the plant could suffer! In autumn and winter, you can reduce the watering slightly since the plant is resting: wait until the soil is dry on a few centimeters to water again with water at room temperature. You will resume watering in the spring when the plant regains growth. Important: use non-calcareous water! Also prefer warm water because the difference in temperature can cause significant stress for anthurium. Prefer delayed fertilizer. Do not put too much fertilizer, which causes rapid growth and weakens the plant against parasites and diseases. Repot your anthurium regularly! Make it every two years in a slightly larger pot, to allow the anthurium to continue to grow slowly. Replace some of the soil with potting soil, heather and sand. During this operation, pinch the flowers so that the plant can concentrate its energy on the recovery. Use a sphagnum mulch to limit drying of the upper roots. You can also put the pot on a bed of pebbles, clay balls or gravel still wet, it will appreciate! Anthurium does not support the dry air of our interiors! In winter, when the heater is running, spray regularly the foliage with water.